Launch the Virtual Infrastructure Client. If you don’t have it, just http:// to your VMware ESX host and grab it from the front page. 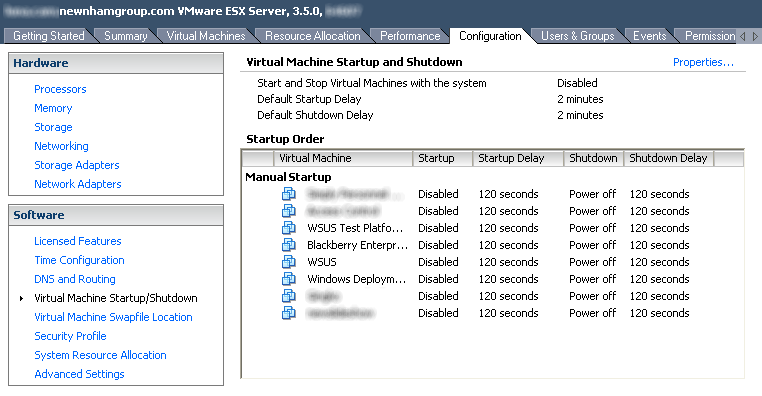 Go to the Configuration tab of your ESX Server, then click on Virtual Machine Startup/Shutdown. By default (I’m pretty sure) automatic startup is disabled. To enable it, click on “Properties…” on the far upper right of the window. 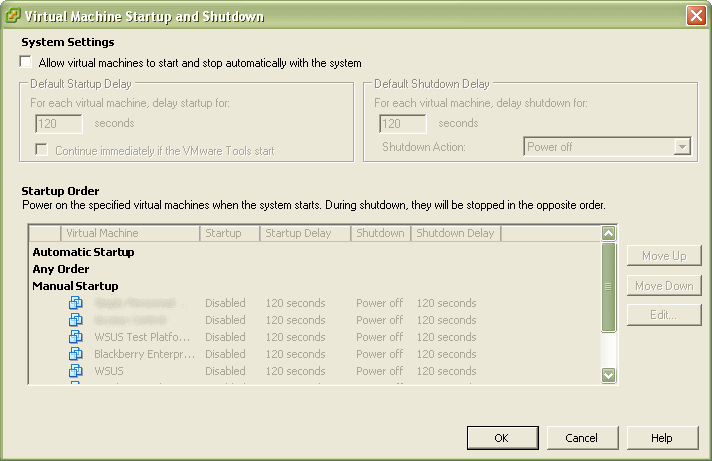 Check/Tick “Allow virtual machines to start and stop automatically with the system”. You know you want to “enable” your Guest OSes to automatically boot, but how? I tried clicking and dragging, right clicking for a context menu to enable “Automatic start up” and gave up. Turns out, you need to click on the Guest OS you’d like to enable, and then click “Move Up” until it sits underneath the “Automatic startup” title. Argh! I’m glad there are people out there that care enough to share. Thanks, this saved me a lot of frustration. Thanks. I was looking in the VM properties for this and scratching my head. Thank goodness for Google and generous folks like yourself. I’m glad I found your article, I was starting to think ESXI wouldn’t allow it. It really is a very good tip, saved much time.